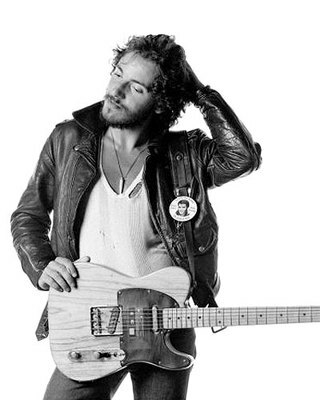 The Boss is dropping his new album with the E Street Band, Magic, on October 2. This for sure means a tour. I was hoping he would come back one more time with the Seeger Sessions Band (SSB) but it was not to be. It could be the last time the E Street Band tours as a few members, including the Big Man, that have health problems. Ah, to be an aging rock 'n' roller. I guess I'm not one to talk with the clots and all. I've been to 4 Bruce concerts, 2 with my friend, Scott. He gives the best live show ever. My husband, Jeff, who for some dark, weird reason isn't the biggest Springsteen fan joined me for the SSB concert in 2006. After the first song played (John Henry), Jeff turned to me and said it was the best song he ever heard. It was true - it was a magnetic concert that was one of the best nights of my life. My favorite Springsteen song is Badlands. A lot of his songs have special meanings to me which I will sometime bore you with. The oldies are, of course, classics. Of his recent albums, I'm particularly fond of his album The Rising and I love the song Devils and Dust. I like the live SSB album better than the original and love his cover of Atlantic City (can it be a cover if it is his own song?). I think I owe a paragraph to the SSB concert and the music. PBS was running concert footage called "Live in Dublin." I think it is the same as the DVD from the CD/DVD combo of Live in Dublin. Anyway, if you get a chance - watch it! The musicians are excellent. I was also lucky enough to get a decent boot from the concert I attended in Milwaukee. Mmmm - John Henry, O Mary Don't You Weep, Cadillac Ranch (hey little girlie...), Jacob's Ladder, Pay Me My Money Down, Ramrod, Open All Night - all fabulous. I must say that Open All Night was much better in Milwaukee as Patti (Bruce's wife and a member of the E Street Band) wasn't there and the awful Sessionettes didn't sing. However, I loved Patti on When the Saints from the Dublin sessions. great write ups on two of your favorite guys!! !